New Delhi: General Bipin Rawat, the Army Chief today underscored the strong image of Indian Army and exhorted all ranks to further strengthen its professional reputation. The Army chief was delivering his opening address at the Biannual Army Commander’s Conference at Manekshaw Centre in Delhi Cantt. He said that all systems were working well and complimented the Army personnel working on the ground. The Army Commander’s Conference is an important event in the planning and execution process of the Indian Army. To ensure due diligence, decisions are taken through a collegiate system comprising the Army Commanders and other senior officers. The Army Commander’s Conference provides a forum to deliberate upon the prevailing security scenario, besides strategic and actionable issues to guarantee an effective combat edge of the Indian Army. 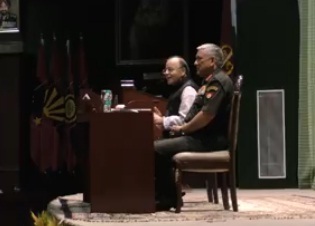 Defence Minister Arun Jaitley, speaking at the Army Commander’s Conference, emphasised National challenges and Government’s initiatives for modernisation. He complemented the senior military hierarchy saying ‘whenever the challenges multiply or their nature changes, Indian Army has always outperformed itself’. He stated that modernisation of defence equipment is government’s topmost priority.